Gladiator is a 2000 epic film directed by Ridley Scott, starring Russell Crowe, Joaquin Phoenix, Connie Nielsen, Oliver Reed, Djimon Hounsou, Derek Jacobi, and Richard Harris. 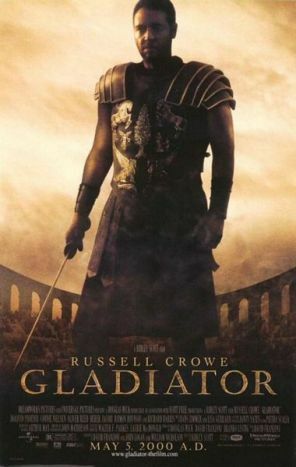 Crowe portrays General Maximus Decimus Meridius, favorite of the Emperor Marcus Aurelius who is betrayed and murdered by his unhinged son, Commodus (Phoenix). 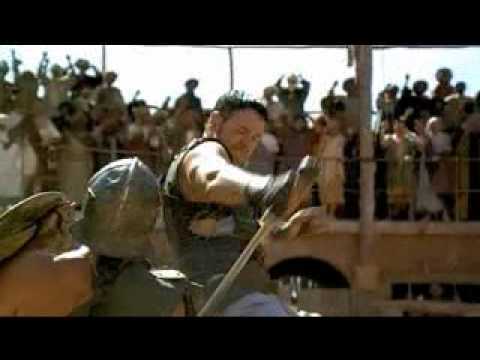 Captured and enslaved along the outer fringes of the Roman empire, Maximus rises through the ranks of the gladiatorial arena to avenge the murder of his family and his Emperor. Released in the United States on May 5, 2000, it was a box office success, receiving generally good reviews, and was credited with briefly reviving the historical epic. The film won five Academy Awards in the 73rd Academy Awards ceremony, including Best Picture and Best Actor (Russell Crowe).